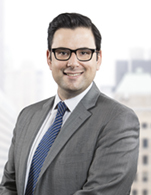 Corey's principle areas of practice include maritime law, insurance law and trade and commodities law. He has significant experience counseling and representing insurers, vessel owners, charterers, and commodities trading companies in maritime, insurance and commercial disputes in state and federal courts and in arbitration. Corey also regularly acts for vessel owners and financial institutions advising on US law aspects of vessel financing, vessel sale and purchase, vessel registrations and flagging, including the preparation and issuance of U.S. maritime law mortgage opinions.